Where Writers Wrote in New Orleans tells what it is about the city that has always attracted the creative mind,in particular writers. Author Angela Carll brings her many years as a realtor, newspaper real estate columnist and tour guide to identifying the kinds of buildings and neighborhoods that have housed our most celebrated writers --William Faulkner, Tennessee Williams, Anne Rice and Richard Ford, to name a few-- and hundreds lesser known. She includes restaurants, bars and other hangouts known for attracting a literary clientele and fills the pages with fascinating facts and secrets of the hundreds of novelists, non-fiction writers, poets and journalists who immersed themselves in the city's spirit as natives, part-time residents or long term favorite sons from the city's founding in 1718 to the present. This is a visually beautiful book with Eugene Cizek's wrap-around water color of Tennessee Willams' house in the French Quarter for the cover and pen and ink drawings of iconic buildings throughout done by Cizek and Lloyd Sensat. An introduction by Eugene Cizek, PhD F.A.I.A explains how the original Creole architecture of the city maximizes the use of light, air and the tropical environment creating, in his words, the spirit of time, place and humanity. In one of America's most loved cities where everyone is either a writer or aspiring to be, this book stands out as a fine gift item and also a treasured reference work. 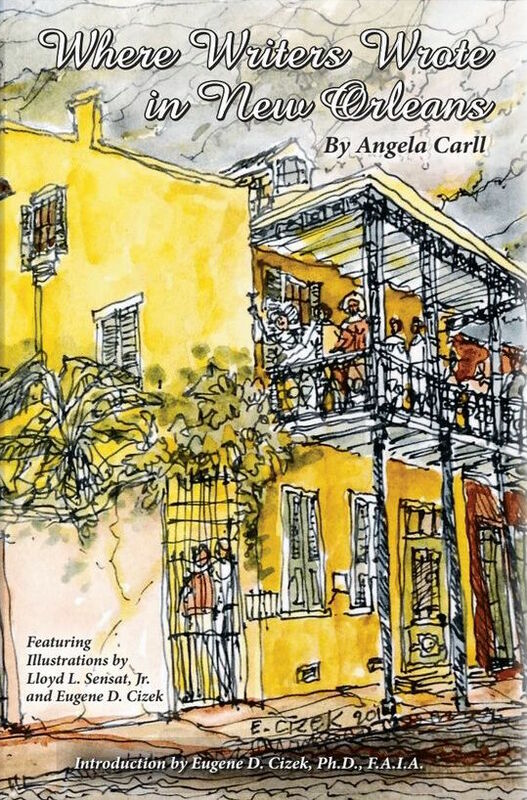 Where Writers Wrote is a briskly written and highly readable guide to writers born in or transplanted to New Orleans during its 300-year history and what neighborhoods each chose to live in, by real estate columnist and tour guide Angela Carll. --Dr. Carol Gelderman, distinguished Professor of English at the University of New Orleans (ret.) and author of 11 books including Henry Ford, The Wayward Caitalist; Mary McCarthy, A Life; and Louis Auchincloiss, A Writer's Life. Why are people so interested in where writers write? Even writers are interested in their fellow scribes' writing spaces. Maybe it's because these places seem to have magic. One thing I know, it's important for the writer to believe it's where magic can happen. Where Writers Wrote lets you into the places where New Orleans' most beloved writers made their magic in and about a magical, mystical city. --Christine Wiltz, author of The Last Madam: A Life in the New Orleans Underworld and Shoot the Money,and recipient of the 2013 Louisiana Writer's Award. Angela Mequet Carll is a native New Orleanian who was a writer and real estate editor for the Times-Picayune for 30 years. She has a Master's degree in English from the University of New Orleans and is a graduate of the International Tour Management Institute in San Fransisco. She has taught both real estate and business writing at Tulane University and is a long time licensed tour guide. She and her husband Russ Carll have three children and four grandchildren. They live in the Faubourg Marigny outside the French Quarter in a small yellow house that once was home to the voodoo priestess Marie Laveau and her seven children. Eugene Cizek, PhD F.A.I.A., has been on the Tulane University School of Architecture faculty for over 40 years. He holds a PhD in Environmental Social Psychology and Masters degrees in both Urban Design and City Planning from the Massachusetts Institute of Technology and a Bachelor of Architecture from Louisiana State University. His publications include Destrehan Plantation (2007), Capturing Oak Alley (2002) and Vestiges of Grandeur (1999). He has received numerous awards,the most recent being the 2011 James Marston Fitch Education Lifetime Achievement Award from the National Council for Preservation Education. Lloyd Sensat, a native of Crowley, La., taught Louisiana history and preservation in the St.Charles Parish public schools for almost 30 years. Before his untimely death in 2011,he was a licensed New Orleans tour guide known for playing the parts of Bernard de Marigny and Papa Noel on special occasions. Cizek and Sensat restored a plantation house in Faubourg Marigny and named it Sun Oak as their historic permanent residence. Order 1 or more by clicking the button above!